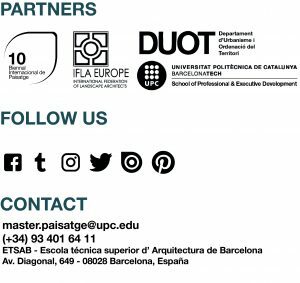 WATER SYSTEMS WORKSHOP – Master in Landscape Architecture Barcelona – Universitat Politècnica de Catalunya – 35ª EDITION. Next March 6 our postgraduate THE WATER SYSTEMS course will start. Especially in regions such as the Mediterranean area, coastal systems and riversides are part of the more specific landscape area. In this field, projects such as boardwalks, riverfronts, wetlands and etc are focused on the improvement of damaged territory. This process always involves deepening our understanding of the interferences between soil and water and consequently vegetation, both from the point of transformation as well as from management and maintenance. This postgraduate course aims to understand the mechanisms of the water cycle, water, and coastal systems. The workshop will be divided into two modules, focusing on the study of those spaces in which water has a predominant role in the landscape. Water Systems I workshop, will be held under the title SWEET AND SALT, by Víctor Ténez and Miriam García. The project will be developed in the Llobregat Delta, where its coastal dynamics and the effects of climate change can be perceived. The course will focus on design with resilience criteria in Viladecans municipality along its coastal line. The projects will focus on the regeneration and adaptation to the public use of the dune system of the Viladecans’ municipality, working with the resilience criteria to face the effects of climate change. This question will evaluate the different management strategies for necessary sedimentary contribution with solutions based on nature. In the same way, Water Systems II workshop will be held under the topic BEHIND NATURE, by Paolo Ceccon, Laura Zampieri, and Agata Buscemi. The work will be developed in Venice and will focus on the transformation of an existing public park. The aim is to adapt it following the criteria of the hydraulic risk, without forgetting the need to activate the urban and social regeneration of a marginal landscape in the city. The course will focus on project experimentation optimizing the water management system, the ability to control the quality and the scale from the urban design to the detail, as well as its capacity to adapt to changes. The final project will be developed through the design of the soil’s morphology, of water and urban space. It will aim to create a renewed idea of the city, of its ecology, and of its adaptability and its ability to coexist.